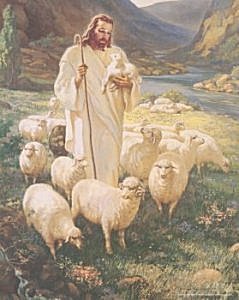 "The sheep is worthy of divine rescue simply because it is loved by the Good Shepherd. Today, I took my troubled young adult son to an orientation meeting across town for his new job that starts tomorrow. After he had been inside only a moment, he rushed back out, his face flushed, slamming the door as he climbed back in our van. Apparently, he had forgotten the necessary paperwork to attend the orientation, and now has to go on another day, and won't get to start his first work day tomorrow. Earlier I had been annoyed that I had to take him half an hour away from home on a hot afternoon, telling him sarcastically that he owed me a milkshake when he gets his first paycheck. But in that moment of his frustration, all I felt was love. On our way home, I felt impressed to pull over and buy us both a small ice cream cone in the drive-thru. After I put in my order, he asked me, "Why would you say that I owe you a milkshake, but then you buy me ice cream on the way home?" All I could do was smile and say "Because I love you." And as we rode home with our drippy ice cream cones, we had one of the best conversations we have had in quite a long while. No. Not really. God did. The Lord reminded me that He loves us all, no matter what mistakes we have made. And He makes it possible for me to love my son, even when he is not perfect, either. I pray that one day, my wayward son will come to know that his Heavenly Father loves Him-- because his mama does. You are so wonderful to listen to the Spirit and follow it. I've no doubt you and your son will remember the day and the bond you created. Thanks for sharing. Hi, I just found your lovely blog! I have had similar experiences with my fifteen-year-old son and the Spirit influenced me to show him more love. I would say that this all happened just so you could have this sweet moment with your son to show him how much you love him. This was an endearing post; thanks for sharing it. Sending loving thoughts and hugs your way!